Earnings continued to dominate the tape this week, with notable reports from tech giant Microsoft and railroad operator CSX. In economic news, consumers took center stage with retail sales being the highlight of the week. Amazon’s Prime Day showed consumers kicked off the third quarter on a strong note, attracting shoppers to a day of deals. Rival retailers also jumped on the bandwagon, posting strong sales of their own. For the week, the Dow rose 0.15%. For the first time ever, resurgent tech giant Microsoft topped $100 billion in annual revenue. An 89% increase in cloud revenue helped lift the company’s second quarter earnings to $1.13 a share, beating estimates of $1.08 a share. Quarterly revenue was $30.1 billion, above estimates of $29.2 billion. The company’s cloud division is poised for further gains as just this week it inked a deal with retail juggernaut Walmart to use the company’s cloud solutions to make shopping quicker and easier for customers, allowing Walmart to better compete against arch-rival Amazon. Earnings results weren’t all about Microsoft’s cloudy outlook. The company also posted strong results in Office 365 and gaming, with sales rising 38% and 39%, respectively. The gaming division in particular could be another strong future earnings driver for Microsoft as the company continues to invest in content for its more than 57 million active Xbox users. In the industrial sector, railroad operator CSX was the first of the railroads to post results. Earnings for the quarter were $1.01, crushing estimates of 87 cents a share. Revenue was $3.1 billion, exceeding estimates of $3 billion. Quarterly revenue growth was up 6% from a year ago on strong economic growth. Forest products revenue rose 11%, driven by residential construction. Meanwhile, intermodal revenue, which includes the shipment of goods using multiple modes of transportation including rail, ship, and truck, rose 9%, led by growth in international demand. Continued economic growth, along with a trucking shortage, should continue to boost demand for railroads. Retail sales rose 0.50% in June to $506.8 billion. That follows on the heels of May’s upwardly revised 1.30% increase. Sales growth was broad-based with gains in autos, gasoline, health & personal stores, restaurants, and home furnishing stores. Health and personal care stores in particular saw robust sales, posting their largest monthly increase in more than 14 years. Retailers received another shot in the arm this week as shoppers flocked to Amazon’s Prime Day. Amazon’s Prime Day was hatched in 2015 to celebrate the company’s 20th anniversary. Since then, the deals have grown to become an annual event not only for Amazon, but rival retailers, with Prime Day now rivaling traditional shopping events like Black Friday and Cyber Monday. Despite early glitches, Amazon announced more than 100 million products were sold on Prime Day. Analysts estimate those sales totaled $4 billion. Rival retailers also got a boost from the Prime Day event as they held sales of their own. According to Adobe Analytics, retailers with more than $1 billion in revenue saw a 54% increase in sales compared to an average Tuesday. The second quarter’s retail momentum seems to have carried over into the third quarter as consumers continue to remain confident in boosting their consumer spending, supported by tax cuts and a strong jobs market. With few major economic releases this week and no new developments on the trade front, earnings and consumer spending drove the tape. This week’s earnings results have pushed Q2 2018 earnings growth estimates to 22.0%, up from last week’s estimate of 20.90%. Of the roughly 90 companies that have reported results, 84% have exceeded analyst estimates, which is well above the long-term average of 64%. If the earnings beats continue on this track, earnings growth in the second quarter could rival Q1 2018 results. Continued strong earnings results and economic reports should continue to support markets. The first estimate of Q2 GDP is set to be released next week. Economists are calling for GDP of 4.00%, which would be the first time it hit that level in four years. We’ll also check in on the housing market with reports on new and existing home sales. 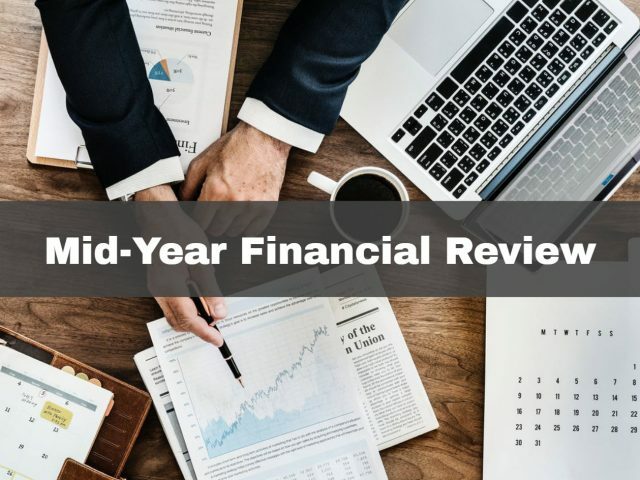 As a follow up to last week’s piece on mid-year personal financial reviews for individuals, this week addresses what entrepreneurs and business owners should analyze to ensure their business is on track for the second half of the year and to avoid any year-end scrambles. As always, please do not hesitate to call one of our advisors if you have any questions or concerns about your financial review. Review your buy-sell agreement or other succession plan you may have in place for your business. Update your business valuation if necessary and ensure your insurance coverage is appropriate for the current business value. Compare cash flow projections against actual revenue and expenses for the past six months. If you went over the estimated amount for expenses, then determine if you still have cash on hand to cover current liabilities and consider where you can reduce expenses if necessary. Analyze your budget and revise if needed to incorporate changes in revenue and/or expenses. Analyze revenue streams to ensure they remain profitable and address any lines of business that might not be performing as expected. Confirm estimated tax payments are accurate. If you are required to pay estimated quarterly taxes, you should have made two tax payments this year (April and June). Accurate estimated tax payments can help you avoid potential penalties or interest charges for underpayment. Check tax paperwork for employees and contractors to confirm employee/contractor classifications are accurate and make sure you have complete, signed W-4s and W-9s on file. Check your retirement savings status and take deductions for contributions you may make to employee accounts. Maximize your own saving opportunities. Conduct a risk analysis to identify threats to your enterprise such as competition, loss of a key employee, the impact of a potential trade war, and countless other risks and take steps to prepare, adapt, or guard against them. Review your business insurance coverage as well as your health and disability insurance. Remember your personal, family, and professional goals and make sure your business is creating the profits necessary to provide for you, your family, and your employees and for the life you desire. Non-financial goals such as personal satisfaction and achievement, pride in the job, and a flexible lifestyle are often considered important factors for business owners to evaluate. Get organized with the first six months of business expenses, deductions, and other tax information to make tax preparation easier. Don’t skip the check up, even if you miss the halfway point. You can still do a review before the end of the summer. Your financial advisor can help make sure everything is in order, and a check up can identify any adjustments that you may need to make to put you, your employees, and your enterprise in the best position to accomplish year-end goals.